GALLIONS STATION on the Port of London Authority Railways. This system, which serves almost all the London docks, has a track mileage of nearly one hundred and forty. Apart from an immense volume of goods traffic, passenger trains are run on the railway by the LNER between Fenchurch Street and Gallions Stations. THERE exists in England a busy railway system with nearly a hundred and forty miles of permanent way, operated almost entirely without signals, serving the needs of one of the world's greatest ports, and fulfilling an essential part in feeding the people of Great Britain. This is the little-known but important undertaking officially styled the Port of London Authority Railways. This system links up the main lines with the whole of the docks, except the London and St. Katharine Docks, and the Surrey Commercial Dock - the only one situated on the south bank of the Thames. The docks north of the river are grouped as follows: The London and St. Katharine Docks, the West India and Millwall Docks, The East India Dock, The Royal Victoria and Albert and King George V Docks, and Tilbury Dock, in Essex. The Port of London extends over the tidal portion of “London River”, from Teddington Lock, Middlesex, to an imaginary line seventy miles lower down the river, drawn from Kent to Essex. It handles approximately a third of the total overseas trade of the kingdom (imports and exports). It is the principal port in the country for tobacco, wines, spirits, fruit, wool, meat, grain, and other foodstuffs, and deals with a quarter of all the timber annually imported. The beginnings of the Port of London are lost in the mists of antiquity, but its recorded history goes back to the days of the Roman occupation of Britain. The first dock, which still exists under the name of the Greenland Dock, was constructed in 1696, when it was known as the Howland Great Wet Dock, and now forms part of the Surrey Commercial undertaking. It was not, however, a dock in the modern sense of the term, as there were no warehouses or other accommodation for loading, unloading, or storage. Its chief purpose was to afford a safe anchorage for ships, to which end trees were planted so as to break the force of the wind. The first dock proper was the West India Dock, which was sanctioned by Parliament in 1799, and opened three years later by William Pitt, the Prime Minister at that time. Since 1909 the whole of the dock system has been vested in the Port of London Authority or PLA, a public body with a constitution resembling that of the London Passenger Transport Board. The PLA has jurisdiction over the seventy-miles stretch of river to which reference has already been made. The largest of the docks are the “Royal” group, which are really one divided into three sections, and claimed to be the largest enclosed dock area in the world; they cover just over 1,100 acres, with a water area of 246 acres, and twelve and three-quarter miles of quay. The total area of the London Docks is 4,203 acres, with a water space of 722 acres, and forty-five miles of quays for the loading and discharge of merchandise. The Authority’s railways, which are largely a heritage from the days of separate company ownership, connect the docks, sheds, and warehouses with the main railway system, thus enabling merchandise to be dispatched and received between a ship and any part of the country. Direct communication is given with the LNER and LMS Railways, while the Great Western also has access by means of running powers over the North London Section of the LMS. The Royal Victoria Dock, although far from being the oldest, was the first to have railway facilities, and is claimed to have been the first railway-equipped dock in the world. It was built in 1855, during a period of great railway and industrial expansion throughout the country, and its owners, “with commendable prescience as to the potentialities of the new form of transport, laid down two lines over which all traffic was worked”. As happened on the Bass brewery line, horse haulage was at first employed on the dock lines. The reason was partly because the method was, in those days, considered adequate to meet traffic requirements, and partly because of a “certain timidity, or deep-seated objection to anything moving on wheels and shooting forth smoke and sparks”. In this connexion, the PLA locomotives to-day burn nothing but Welsh coal, because of its smokeless properties. The importance of the Victoria Dock lines lay largely in the fact that they gave direct access to the Great Eastern Railway (now incorporated in the LNER) by a junction at Connaught Road. The line thence to Gallions, now known as the Royal Albert Dock Railway, which has two intermediate stations and is 1 mile 61 chains in length, is the only section of the Authority's railways on which passenger traffic is now regularly worked. LNER coaching stock is used for the purpose. When communication with the Great Eastern was first provided, the method of working was for the railway company to hand over wagons at the beginning of the dock lines, on which they were hauled by horses. This system had obvious inconveniences, and although there is no record of the exact date on which locomotives were substituted for animal traction, the Millwall Docks, which were opened in 1864, were from the outset equipped with adequate railway facilities, including locomotives for the handling of internal traffic. The “deep-seated objection” to the use of locomotives on the dock lines died hard on other sections of the dock system, which until 1909 was in the hands of a number of separate companies. Thus the East and West India Docks remained without any railway facilities until the 1880’s, while in certain areas the tracks never penetrated until the Port of London Authority undertook an extensive programme of improvements. 900,000 PASSENGERS are carried annually over the lines of the Port of London Authority Railways. The system has direct communication with the LNER and LMS Railways. This illustration shows a Gallions-Fenchurch Street train. The West India Dock Company also showed its opposition in other ways, notably when it was proposed to build the London, Blackwall and Millwall Extension Railway, which improved the position of the Millwall Dock undertaking by linking it up with the main railway system, but in the process also traversed West India Dock property. The owners of the West India Dock fought the project step by step. When the line was in 1869 opened for passenger traffic, which was at first worked by a combination of horses, endless cable, and locomotives, they “appointed a manager to look after their interests on their part of the line and to resist the steam engine”. But this attitude of obstruction could not stay progress indefinitely, and in 1880 the Board of Trade gave special sanction for the use of locomotives, which enjoyed the local nickname of “Coffee Pots”. The Millwall line, although only a mile and a half long, was owned by three separate companies, and, before its reconstruction, had no fewer than five level crossings and three swing bridges on its short length. The passenger service, which was worked in conjunction with one to and from Fenchurch Street, proved remunerative for many years, but the competition of motor omnibuses and other newer forms of transport subsequently caused it to be operated at a heavy loss. After trying to bring about an increase in traffic by running steam rail motors, the Port of London Authority decided in 1926 to close the line for passenger business. But its importance for goods traffic is, of course, still considerable. The present system, including the Royal Albert Dock Railway, which is the only section to be provided with signals, is 139 miles 61 chains in length. The Albert Dock line, although built on private property, was constructed as a statutory undertaking, and the Act of Parliament obliged the dock company to run two passenger trains a day, one in the morning to Gallions, and a second, in the evening in the reverse direction. This modest requirement would hardly suffice to meet present-day conditions. About 900,000 passengers a year are now carried, and the service, which is operated at approximately half-hourly intervals, extends from before 7 am to after 7 pm. Much of the traffic is, of course, represented by the army of dock workers, officials, and others engaged in business in the docks and warehouses, but there is also a considerable volume of ocean liner passengers, to which more detailed reference is made below. The PLA Railway system fulfils a dual purpose. It facilitates the movement of internal traffic, and enables through traffic to be operated to and from the main lines. The Royal Albert Dock Railway exemplifies both these functions. When this dock was built, an adequate railway system was provided, together with interchange facilities with the Great Eastern Railway. Loco-motives were at once introduced, and the Dock Company worked a passenger service with its own locomotives and coaches between Custom House and Gallions Stations, a distance of just under two and a quarter miles. 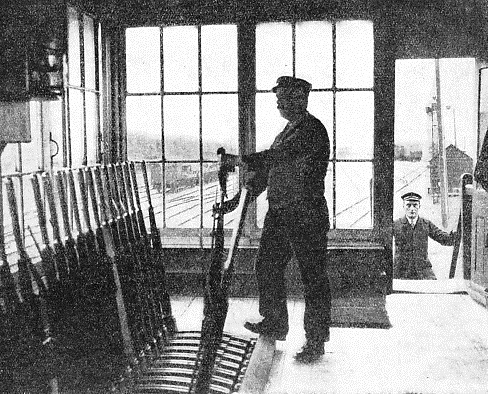 A MANUALLY-OPERATED SIGNAL BOX on the Royal Albert Dock Railway. As many as 1,155,685 tons of merchandise passed over the lines of the Port of London Authority Railways in 1934; these remarkable figures indicate the volume of traffic on the lines. 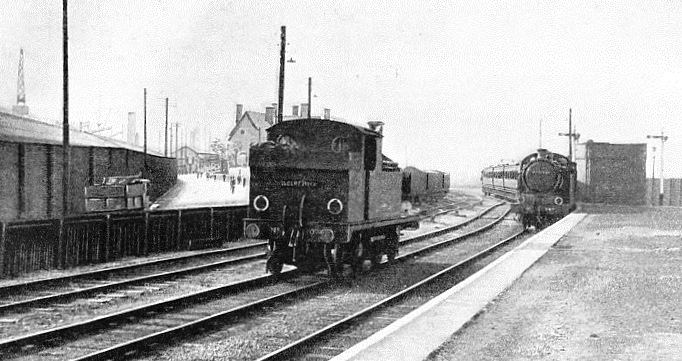 For economic reasons this service was eventually withdrawn; the Dock Company disposed of its passenger stock, and entered into an agreement with the Great Eastern Railway under which the latter undertook to combine the running of the former separate dock railway service with its own service from Fenchurch Street and Stratford. In addition to lessening expense, this arrangement improved the train service by obviating the necessity of changing at Custom House Station. The railway company worked the service on a train-mileage-payment basis. The LNER continues to work the trains through between Fenchurch Street Station and Gallions. In this way, the Port of London Authority Railways are given direct and regular communication with the main railway system for passenger as well as for goods traffic. As already mentioned, goods traffic is worked to and from the docks by three of the four great railways. The business embraces almost every variety of foodstuffs, general merchandise, livestock, and even such exceptional consignments as railway coaches for export overseas. Over a hundred booked and special trains are dealt with daily at the Port of London, including the express goods trains from Tilbury, which carry traffic to remote destinations. A few details of the working of these express goods trains may be of interest. Tilbury Docks have in recent years undergone considerable improvement and enlargement, and this section of the Port of London is now equipped with every facility for dealing with the largest passenger and cargo vessels. Express goods traffic from Tilbury is, where possible, dispatched early in the day, and the trains are made up so as to serve a considerable number of destinations. A typical example of a day's work is provided by the running of three trains between 9.57 am and 3.20 pm, which between them deliver merchandise to Aberdeen, Belfast, Birmingham, Bradford, Derby, Dublin, Edinburgh, Glasgow, Leeds, Leicester, Liverpool, Manchester, Nottingham, Sheffield, Stoke-on-Trent, Warrington, and Wolverhampton. Many of these places are themselves ports of first-class importance, and the existence of such port-to-port traffic is an indication of the position occupied by the Port of London as a clearing house for merchandise from all over the world. The merchandise traffic dealt with at the Port is largely of a seasonal and fluctuating nature, as is typical of sea-borne trade. The heaviest months for meat, for instance, are July, August, and September. There is, however, no special “peak” period, the fluctuations largely depending on the nature of the commodities dealt with at various times of the year. Although it no longer operates coaching vehicles, the Port of London Authority owns a respectable amount of working stock. The locomotive stud numbers twenty-seven, all tanks of neat design, and divided into two main classes of 0-4-0’s and 0-6-0’s. Wagons were introduced at an early date, at first mainly, if not entirely, for the handling of internal traffic, for which some of the present stock is still exclusively reserved. The wagon stock totals 602, of which rather less than half - 273 to be precise - are open trucks. In addition there are seventy-six box vans, seventy-seven insulated vans for perishable traffic, and 176 flat trolleys for the conveyance of timber. These last compose over a quarter of the entire wagon stock; the proportion is intelligible when it is realized that over two million tons of timber, or a quarter of the total timber imports into the United Kingdom, are annually landed in London. Because of the large tonnage of merchandise that is directly transferred between steamships and road vehicles, statistics of the total tonnage handled on the Port of London Railways are apt to be misleading, especially as the predominance of imports over exports necessitates a large amount of empty wagon working. The total year’s volume of traffic varies, of course, in accordance with world trade conditions. A typical figure is that for 1934, when 1,155,685 tons of merchandise were carried over the Authority’s Railways, necessitating the use of 429,887 wagons. This works out at an average load of only about two and three-quarter tons a wagon. But if allowance be made for the empty workings, and also for the fact that much of the traffic, such as fruit, is made-up merchandise whose bulk is disproportionate to its weight, it will be seen that the wagon loading figures are not to be regarded in the same light as those of a main line whose traffic is largely made up of coal and other minerals. As already stated, signalling is confined to the Royal Albert Dock Railway. When special passenger trains are worked over the other dock lines, safety of operation is secured by the observance of the Ministry of Transport regulations requiring all points to be clipped and padlocked, and flagmen to be on duty. This special passenger traffic is among the most interesting operating features of the PLA Railways. It is composed of passengers and their friends travelling to and from ocean liners and other steamers. It is worked both by the LNER between the Royal Docks and Liverpool Street and Fenchurch Street, and by the LMS between Tilbury, Fenchurch Street, and St. Pancras. The “Boat Specials” often handle a heavy volume of traffic, and this business is also of a much more extensive nature than is usually realized, as many as 1,100 “specials” having been run in a single year. The shipping lines concerned include the Cunard-White Star, Orient, Atlantic Transport, and Peninsular and Oriental. As with the goods traffic, special arrangements have been made at Tilbury to deal expeditiously with the passenger movements. With the improvements made during recent years it is claimed that “the close proximity of the train to the ship literally allows of walking direct between ship and train”. From three to four special trains are often run in connexion with the arrival or departure of a single liner. Four trains carrying 1,034 passengers and their baggage have been dealt with in an hour and twenty-five minutes. On other occasions, four sets of three trains, conveying from 1,052 to 1,348 passengers, have each been handled in between an hour and an hour and a half. Exceptional facilities are provided for dealing with the Peninsular and Oriental traffic. Three trains of the normal make-up of nine coaches can stand at one platform at the same time, and each can be dealt with without interference with any of the others. The crossover roads are of the scissors type, which permit the running round of engines or haulage to and from the sheds without fouling any of the sections containing trains. Expedition characterizes also the handling of the goods traffic at Tilbury Docks. A typical instance is the loading of 120 bales of wool, necessitating the use of five wagons. Loading began at 1 pm, train left the dock at 3.20 pm, reached Brent at 7 pm after a circuitous journey round London and its environs, and arrived at its ultimate destination at Bradford, Yorkshire, within eighteen hours of the beginning of unloading. This represented no exceptional performance. The traffic is handled in such a way that, as far as possible, merchandise leaving Tilbury one day shall be handed over to the consignee early the next morning. At first sight, it may seem curious that the Surrey Commercial Dock, which includes the first to be built in London, should, similarly to the London and St. Katharine Docks, still be un-provided with direct railway communication. Considerable thought has been given to the possibility of introducing railways at the Surrey Dock, which is situated adjacent to the bend in the river known as Limehouse Reach and the Lower Pool. But physical difficulties have hitherto made this impracticable, and the alternative method has been adopted of sending traffic by barge from the Surrey Dock to those with railway connexions, in particular to the Millwall Dock. Large quantities of grain are dealt with in this manner. Moreover, the Central Section of the Southern Railway is in close proximity to the southern end of the Surrey Dock, and a connexion that runs for a short distance into the dock has on occasion served as a railhead. So far as the London and St. Katharine Docks are concerned, their proximity to the centre of London and to such railway depots as Royal Mint Street, LNER, considerably reduces the gap between the docks and the main railway systems of the country. The Railway Department of the Port of London Authority is worked as a separate undertaking, under the management of a Railway Superintendent, whose functions are distinct from those of the Docks Superintendent. The Superintendent at the time of writing is Mr A. Phillips, who had seen service on the Great Western Railway before taking charge of the largest and most important dock railway system in the world. It is perhaps necessary to point out that the term “private railway” is applicable to systems of widely varying natures, and that the Port of London Railway occupies a somewhat exceptional position. Although it is an undertaking situated entirely within private property, it performs the same functions as an ordinary public railway, as it carries general merchandise for others. It thus differs from such private systems as those of the Bass Brewery and of the Gas Light and Coke Company’s works at Beckton, Essex, and also from the interesting private system at the brewery of Messrs. Arthur Guinness, Son and Company, Ltd, at St. James’s Gate, Dublin. As with the Bass undertaking, the Guinness Brewery, one of the largest in the world, had already been established for many years before it was provided with railway facilities. ENGINE NO. 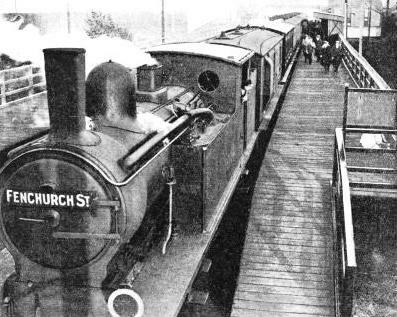 12, one of the 0-4-0 narrow-gauge tank locomotives in operation on a private railway at St. James’s Gate Brewery, Dublin, owned by Arthur Guinness, Son & Co, Ltd. This locomotive has cylinders 7 in by 8½-in, wheels of 1 ft 10-in diameter, a total heating surface of 86 sq ft, and a boiler pressure of 180 lb per sq. in. The system to-day consists of ten, miles of line, and has two noteworthy operating peculiarities. The tracks are both broad and narrow gauge, and the area within which they are laid - about sixty acres - occupies three different levels. Between the highest and lowest level there is a difference of approximately 60 ft. Eight miles are on the 1 ft 10-in gauge, the remainder being laid to the Irish standard of 5 ft 3-in. The highest or “Upper Level”, on which are situated the two breweries, the fermenting rooms, and the hop and malt stores, stands some 60 ft above the quay on the banks of the Liffey. The “Middle Level” accommodates a vast malt house. The cooperage shops, cask-washing sheds, filling stores, and loading platforms are on the “Lower Level”. Since the railway serves practically the whole of the brewery, communication between these three levels has necessitated some heavy gradients. On one section of the narrow-gauge lines there is a tunnel with an incline of 1 in 39 that bridges a difference of 25 ft between the Middle and Upper Levels. This tunnel is a remarkable engineering feat, being of the “corkscrew”, or spiral, type usually associated with mountain railways rather than with a works line, and is taken through two and a half turns with a 60 ft radius. NARROW-GAUGE ENGINE FOR BROAD-GAUGE LINE, The broad-gauge lines of St. James's Gate Brewery were for many years operated by narrow-gauge locomotives mounted on broad-gauge haulage trucks. The driving wheels of the engine were geared to the wheels of the truck. Normal broad-gauge engines have, however, been introduced on the system. These ten miles of line really represent two distinct systems. The narrow-gauge tracks, which have the advantage of being able to penetrate sections of the premises where a 5 ft 3 in gauge would be out of the question, handle internal traffic. The loads dealt with include malt, hops, grains, and casks. The purpose of the standard gauge lines is to interchange traffic with the main Irish railway system, the whole of which is connected with the Brewery. The broad-gauge tracks serve the loading and unloading banks, and are partly laid on public highways. They link up directly with the Kingsbridge sidings of the Great Southern Railways, and thus indirectly with lines serving the Irish Free State and Northern Ireland. The activities of road vehicles within the brewery limits have made it necessary to lay the narrow-gauge tracks so as to cause no interference with drays and motor lorries. Tramway methods of construction have been adopted, and the lines are laid between granite setts. 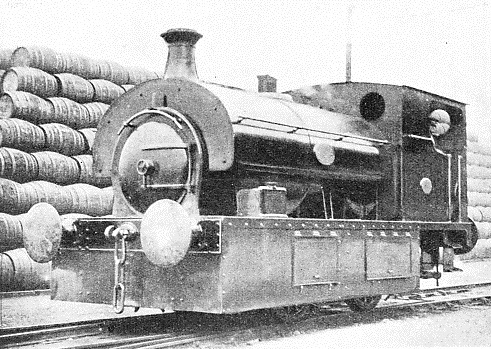 BROAD GAUGE LOCOMOTIVE No.3, built by Hudswell, Clarke & Co., Ltd., of Leeds, for the two miles of 5 ft 3 in gauge track laid within the St. James’s Gate Brewery, Dublin. 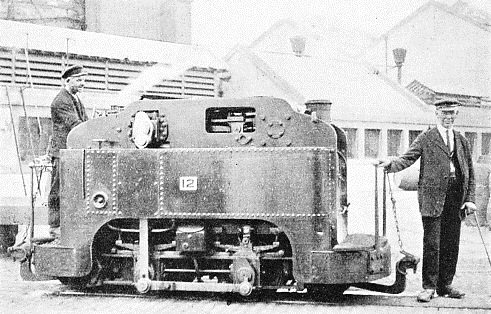 The main dimensions of this 0-4-0 saddle-tank are: cylinders 15-in by 22-in; diameter of wheels, 3 ft 4-in; boiler heating surface, 649 5 sq ft; firebox area, 66.5 sq ft; grate area, 10 sq ft; and weight (empty), 24 tons. The broad-gauge locomotives, of which there are two, are 0-4-0 saddle tanks, which follow standard railway design save that, because they run on the public highways, their wheels are cased in, as is the practice on the Belgian National Light Railways. The narrow-gauge locomotives are unorthodox. 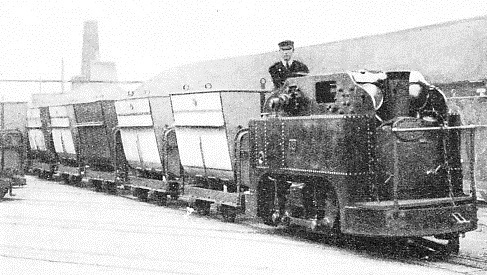 These are 0-4-0 side tanks, with a small platform at either end, and have the cylinders placed above the boiler, transmission to the cranks being by means of flexible jointed side connecting rods. There are nineteen locomotives, built at various dates between 1882 and 1921. The oldest was constructed by the Avonside Engine Company, Ltd, of Bristol, and the remainder at the Cork Street Foundry and Engineering Works, Dublin. It is noteworthy that local builders should have been responsible for both Guinness and Bass Brewery engines. ON THE 1 FT 10-IN GAUGE LINES of the St. James’s Gate Brewery, Dublin. Engine No. 18, built in 1902, is here seen hauling a train of tip wagons. The maximum load normally taken by a locomotive of this type is 75 tons at a speed of four miles an hour on the level. The narrow-gauge locomotives have 1 ft 10-in coupled wheels and a 3 ft wheelbase; the total heating surface is 86.36 sq ft, and the working pressure is 180 lb per sq in, a high figure for such small engines. The weight is 7 tons 15 cwt. 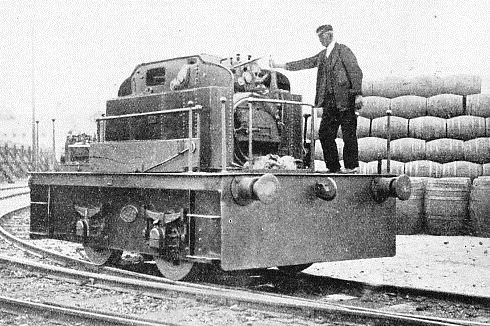 The extent to which working conditions are governed by the gradients can be judged from the fact that while the normal maximum load handled by the narrow-gauge locomotives on level ground is as much as 75 tons, at four miles an hour, it is restricted to 18 tons on the 1 in 39 gradient. The broad-gauge engines, which were built by Hudswell, Clarke & Co., Ltd, Leeds, weigh 24 tons empty. They have a total heating surface of 716 sq ft, a coupled wheel diameter of 3 ft 4-in, and a wheelbase of 6 ft. The dimensions of the cylinders are 15-in by 22-in. Although the broad-gauge lines form an essential portion of the Brewery Railway, it was not until 1914 that the first of the 5 ft 3-in gauge locomotives was taken into use. Before that date, working on the wider tracks was accomplished by an ingenious method, involving the use of what are known as “haulage wagons”, of which four are still in service. These are broad-gauge vehicles on to which a narrow-gauge locomotive is hoisted when required, the engine then occupying such a position that its wheels rest upon others that are in turn geared to the rail wheels of the wagons employed. 0-4-0 TANK ENGINE at the head of a train of flat wagons at St. James’s Gate Brewery. Designed by a former chief engineer of the brewery, engines of this type have their cylinders over the boiler, the transmission to the wheel cranks being effected by flexible jointed vertical side-connecting rods. Water tanks are fixed to the main frame plates on either side. You can read more on “Diesel Shunting Locomotives”, “The Festiniog Railway” and “Railway Curiosities” on this website.